Congrats and welcome to the XLR Net! First I've heard of an XLR or XLR-V with two tops. Can you post some pics of the two tops on and off the car?? What is the last 8 digits of the VIN? 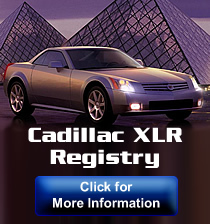 Hi Aaron, We have your 2006 XLR listed in the Registry. Is your 2007 XLR-V in there as well? Nice! Congrats and welcome to the XLR Net! #3755 06 V Red/Ebony is for sale 0n Auto Trader. Not in registry. Corvettes and the Cadillac XLR!